Growing up, I spent a many a childhood days sprawled out on the floor in my grandma's bedroom, reading National Geographic. Between those pages of wonder, discovery, travel and adventure, I innately knew that I wanted to serve as a Peace Corps Volunteer in French-speaking Africa. I wanted to experience Africa in all of its richness, to be a change agent, and to be of service to others. After college I fulfilled this lifelong dream when I became an agroforestry and environmental education volunteer in Sahelian Cameroon. The experience was transformative not only for my cultural exposure, but also by instilling a profound sense of the power of community in me. 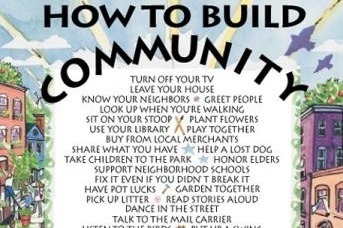 And I better understood how many people working together using their heads (intellect), hands (labor), and heart (passion) could build community, creatively problem solve, and do good. To this day, building community and serving others are core values for me. From first hand experience, community engagement and volunteerism has many individual benefits. My life has been endlessly enriched by countless volunteer opportunities I've had and my communities have been positively impacted. Volunteerism has also been shown to produce important societal benefits as well. For example, non-profits that employ volunteers can better achieve their important missions and can leverage more philanthropic and in-kind resources. Businesses with corporate volunteer programs build community goodwill and better recruit and retain a skilled workforce. And individuals who volunteer regularly are happier, healthier and more employable. The ability to scale the rate of volunteerism in Vermont underscores my Go Fund Me request. According to the Corporation for National and Community Service Vermont ranks 8th in the nation for volunteerism and service. Approximately one in three (33.1%) Vermonters volunteer in-state each year, yielding over 20 million hours of service collectively. This equates to over $451 million of contributed services to our communities and local non-profits. While the rate of volunteerism in Vermont is impressive, the potential to do even more good in our communities is vast. The ability to scale, however, is limited by understaffed nonprofits who often lack the capacity and infrastructure to manage volunteers. Similarly businesses rarely have a designated corporate volunteer program, so volunteer connections are underutilized. This Go Fund Me campaign would enable me to create Vermont Connector, a small woman-owned business, that would connect people, place, and passion through a coordinated approach to community service. The goal of this campaign is to enable me to develop a business and marketing plan, to assess the community and volunteer landscape in Vermont, to directly coordinate volunteer engagement between businesses and non-profit organizations, and to develop resources for more timely and efficient community engagement. I am pleased to share that I have been invited by the Lieutenant Governor to speak about the importance of volunteerism and community service in an upcoming Digital Town Hall Meeting. I'm looking forward to opportunity to share my experiences and to talk about servant leadership. We've been busy at Vermont Connector developing a non-profit volunteer directory. Currently, we've identified 385 Vermont based businesses and non-profits committed to corporate social responsibility and civic engagement. Help us continue to inventory volunteer opportunities across the state with your donation today! The momentum is building!! With your support, I have just launched my Vermont Connector web page (vermontconnector.com), a much needed tool for marketing and outreach. I have also just applied to VTWomenpreneurs to compete for a entrepreneurial start-up package which includes graphics design, financial planning, web development, social media and marketing, logo design, business card printing, and legal advice for new business owners. Wish me luck for the extra boost of rocket fuel with my project. Lastly, today I met with directors from the Fletcher Free Library. I am excited to learn of their equity initiative to help make library services available to all members of our community. With some additional volunteer support, they hope to increase their mobile offerings to area seniors and to have translation services in Somali, French, Nepali, Bhutanese, and Arabic to increase New American access to the library. If you would like to get involved with these projects, please reach out on my web page. September and October have been exciting months for VT Connector. With the help of CVOEO and the Center for Women and Enterprise, I've drafted my business plan and have begun modelling my tools and services. I have continued to outreach to non-profit and service learning leaders about how to amplify their volunteer impact. And good synergies are in the works with participants of the Vermont Leadership Summit, who emphasized volunteerism and civic engagement to best develop our communities. The next step in this journey is to register the LLC with the Secretary of State and to produce marketing and online materials for people to connect with my services. Will you help me to take this next step to connect people, place and passion?